We offer PUPPY and KITTEN socialization classes and GENTLE LEADER training. Puppy socialization and training classes are based on Dr. Ian Dunbar's effective and kind training and behavior videos and books. Classes are held once weekly for 5 weeks. Designed for puppies 8-12 weeks old, classes cover initial training and typical puppy "problems" such as chewing and housetraining. Puppy "play time" is encouraged. Classes are meant for the entire family. 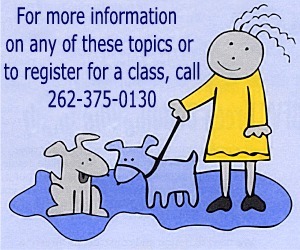 Children (8 and older) are especially encouraged to attend, to learn how to help with their new best friend! 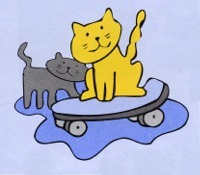 Kitten class is a single one to two hour session, offered on evenings or weekends. We cover training and socialization, so your kitten can become a well rounded feline friend. Gentle Leader halters are relatively new training aid for all sorts of problem behaviors in dogs, including pulling excessively on the leash, barking, biting, dashing outdoors, jumping up and chewing. SocializationThey are a humane form of collar that gives you better control than a choker or prong collar but is much more gentle. These halters take advantage of the dog's natural tendency to give to pressure applied to the bridge of the nose and behind the ears, the places the halter presses against. Our behavior counselors will fit the collar to your dog and show you how to use it. The Gentle Leader comes with a detailed instruction book as well. Videotapes and handouts are available in our office, or call us with questions about this wonderful tool to help you live more peacefully with your canine family member! Behavior counseling is available for many other topics as well, including feline litter box avoidance and furniture clawing, canine boundary training, using the Bark Not citronella collar, which discourages problem barking by emitting a puff of scent dogs don't like, and much more.